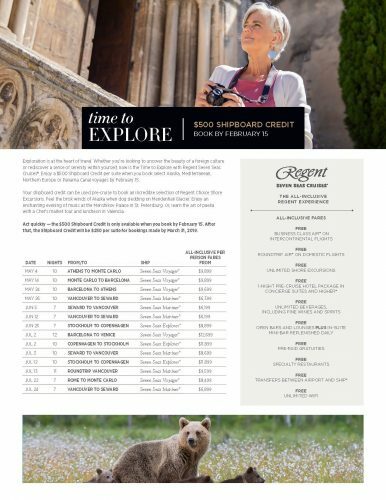 Enjoy every day, exactly as you wish while exploring the world’s most beautiful places on one of many Regent Seven Seas Cruises— with everything included, from flights to excursions and from fine wines and premium spirits to gourmet restaurants. Allow Regent Seven Seas Cruises to take care of every detail as they take you to over 450 destinations worldwide aboard their luxuriously appointed and perfectly sized ships with no more than 375 suites. You really can have it all aboard Regent Seven Seas Cruises! Wallace Pierson Travel has hand-picked approximately 100 itineraries on which you can receive up to an additional $500 shipboard credit simply by booking your cruise through the agency. Select a sailing that is also a Virtuoso Voyage, and enjoy your private “Virtuoso Members Only” cocktail reception in addition to the additional spa or shipboard credit. 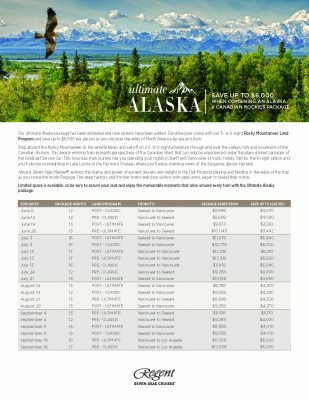 Regent's Latest offer is for "Ultimate Alaska"
Program and save up to $6,000 per person as you discover the wilds of North America by sea and train. through the Panama Canal, and Trans-Atlantic. Contact your advisor when you are ready to plan your next cruise so that we can share additional details!